Unlike other discount or loyalty cards, we are aiming at higher ticket purchases, bringing you essential savings when they are most needed. Discount cards that get you into the water park a bit cheaper or give you a free dessert with your meal have a place but we want our customers to make big savings on purchases. When you use your card the saving is very noticeable. You are part of a group of people who, because of their affiliation to the umbrella company, enjoy maximum savings – like money being put back into your pocket. In addition to great savings on purchases, each cardholder has a chance of winning a share of the Euro Millions Lottery prize. If the numbers shown on the reverse of your card are drawn as first prize, you will be entitled to an equal share of the prize fund – each card has free entry to 104 EuroMillions draws which is equivalent to a saving of €208! All of this is available for just €15 per year. 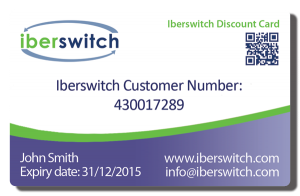 As an Iberswitch customer, you qualify for discounts with over 150 companies, and this number is increasing month on month. Already we have heard from people who have saved hundreds of euros simply by presenting their card at the point of sale.